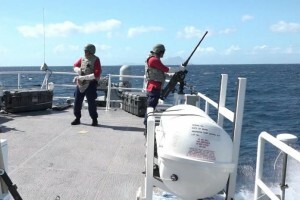 BASSETERRE - Forty-five participants comprising military and coast guard from the Dominican Republic, St Kitts and Nevis and the United States got an opportunity to demonstrate their live fire capabilities during a live gunnery firing exercise on Friday, 13 nautical miles southwest of the Federation’s capital, Basseterre. The activity, which took place aboard the US Coast Guard Cutter Joseph Tezanos and the TTS Speyside out of Trinidad and Tobago, formed part of Phase 1 for Exercise Tradewinds 2018, which runs from June 4 -12 in St Kitts and Nevis. The live firing exercise was geared towards familiarizing officers with the use of a variety of deck-mounted weapon systems namely the .50 calibre machine guns and the 25-millilitre cannon, as well as strengthening their target practice capabilities. Lt. Commander Mario Gil, who is also the commanding officer of the Joseph Tezanos, said that the purpose of the training was not only to fire the weapons but also to bring partner nations closer. Gill said that activities such as the live gunnery firing exercise is extremely beneficial for all partner nations as it is always important to work as one in an effort to ensure that when faced with actual threats countries are ready to protect the borders and most importantly their most valuable resource – the people. “The more we work together, the more we are ready when it comes to real life situations. When we have natural disasters and or bad guys trying to take over our sovereign nations, the more we work together, the better we are at it,” he said. After the exercise concluded Gill reflected on the performance of the soldiers and noted that it was a great chance for them to defend the vessels in the event of an actual attack. He added that the live fire strengthened their confidence. The commander further stated that there were great gunners participating in the training, moving back and forth with the waves and placing rounds on the targets. He encouraged all participants to continue the training whenever the opportunity is afforded to them so that they can continue to build upon what they would have practiced during Tradewinds 2018. Exercise Tradewinds is a US Southern Command-sponsored annual security training exercise. It is an inter-agency multi-national exercise designed to enhance the collective abilities of Caribbean defence forces and law enforcement as they seek to counter transnational organized crime and to conduct humanitarian assistance and disaster relief operations.